If you’ve been reading my blog long enough, you know I’m not one for fad diets. You won’t see me hopping aboard any wagons in an effort to drop a few pounds to fit into a dress this weekend; it’s just not my style. Rather, I focus on eating wholesome, nutrient-dense, filling foods as much as I can, but still leaving room for things like sugar here and there. So are you surprised to see the word “paleo” thrown into this blog title? Let me back up for a second, because I bet some of you don’t know what exactly a Paleo diet implies. I didn’t, until a year or so ago. The premise of the Paleo lifestyle is to consume the foods that our human bodies were designed to eat: meats, vegetables, some fruits, nuts, and healthy fats. Human consumption of dairy, grains, and legumes occurred later with agricultural advances, and thus our genetic makeup is thought to be not fully geared towards metabolizing these foods. Try out a Paleo diet for a while and you’re likely to feel more energetic, stronger, and leaner in time. Not to mention, you just might decrease your chances of developing some of the diseases which didn’t manifest until post-agricultural evolution. But I’m not here to debate the topic of what exactly we humans need to strictly cut out of our diets to achieve the utmost health and longevity. The important point here is that I don’t see the Paleo lifestyle as a fad or gimmic; I do believe it has its merits. As a matter of fact, if I decided to stick to a Paleo diet, I’d consequentially be eliminating all the processed foods, grains, and sugars that I try to keep to a minimum as it is. I’m not ready to take that leap, considering how much I love my dairy and legumes, and I’m convinced they have nutritional benefits too, even if our cavemen and women ancestors didn’t have the option of consuming them. 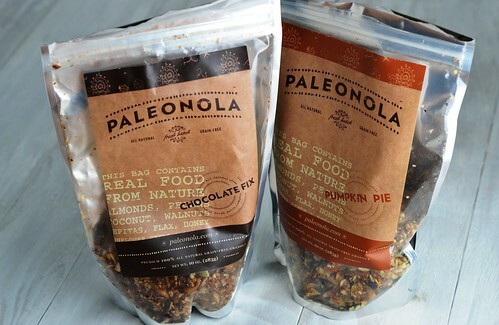 Nonetheless, paleo-friendly recipes and snacks tend to be right up my alley since they’re built on healthy fats and wholesome fruits and vegetables: things I know will make my body run better and feel great.When I heard about Paleonola from a little birdie, my interest piqued immediately. I love to munch on granola, but most commercial versions are quite high in carbohydrates, since they consist mainly of oats or other grains. Additionally, many are quite high in sugar too. But Paleonola is a low-carb granola made entirely of nuts, seeds, and fruits, all naturally sweetened, and therefore, I wanted some, right away. Check out those stats! Paleonola is comparable in calorie per ounce to other granolas (actually, quite less then some) but contains much less sugar and carbohydrates; instead, the bulk of the calories come from satisfying, healthy fats like nuts, coconut oil, and flax. I didn’t wait too long to order* two bags (actually, the kind folks there offered me a 10% discount after we tweeted a bit, which sealed the sweet deal.) Flavors like Maple Pancake and Apple Cinnamon certainly caught my eye, but you know me: I had to go for Pumpkin Pie and Chocolate Fix. The great thing about these granolas (besides being so nutritious, all natural, free of preservatives, and grain-free) is that every bite is chock full of nutty, chewy goodness; you won’t have to go fishing for your favorite bits. The cocoa flavor in Chocolate Fix is more subtle than I imagined, since there are no large chunks of chocolate, but it’s still quite delectable. The Pumpkin Pie flavor is full of toasty pumpkin seeds and irresistibly warm spices. I love it by the handful, or layered with protein-rich Greek yogurt and berries for a satisfying breakfast. Maybe you’re interested in trying out a Paleo diet, or maybe not. Perhaps you’re gluten-free, or dairy-free, or just trying to keep a healthy, balanced diet where sugar and grains are kept to a minimum. Maybe you just want to change up your snacking to something more wholesome, cutting out the junk and filling up on the good stuff. Whichever it is, check your local stores for Paleonola or order some online. You’ll be glad you did! Want more Paleonola? Sign up for their free newsletter for deals, recipes, and more; like them on Facebook or catch them on Twitter. *At the time, Paleonola was not available in any stores near me, but it has since made its debut at a local health foods store. If you’re in the Worcester area and would love to try Paleonola, just stop by Living Earth! I always cringe at the nutritional stats on granola…but these are making me super happy! I want that parfait for breakfast! I hadn't heard of this brand, but love how many paleo products are emerging! Like the raw movement though, I wish there would be more options without added sugars. I love honey, but need more snacks without added sweeteners, you know? Ohhh those flavors sound really good! I was tempted recently to buy some locally made granola sold at whole foods, but it had over 200 calories for 1/4 cup and tons of sugar…knowing I wouldn't be able to resist eating handfuls out of the bag, I resisted buying it. 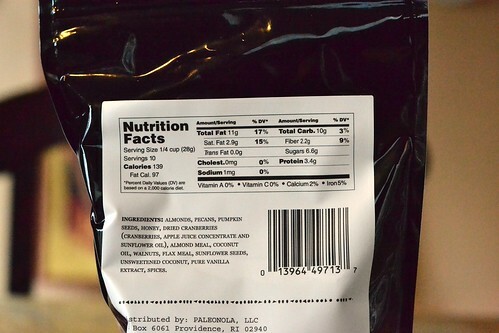 I'm pretty impressed with Paleonola's nutrition stats…I'll have to check it out! Cara, in my book you ARE the fad. I follow you. I've been paleo for a few months now and wouldn't love to try some of this if I can find it! Great post Cara; I love it because it points out an alternative view to the plant based diet. I can definitely agree with the whole foods approach and eliminating refined sugars and processed foods and minimizing grains. I think everyone needs to choose the diet that is right for their own bodies and there is no one way of eating that fits everyone. I was interested in learning about the Paleo diet so I read up on it. I do wonder how feasible it is for people to eat higher quantities of wild grass fed game. Additionally, I can’t help but wonder if through the years we have evolved from Paleolithic times to be able to eat more grains and plant foods and less meat just as all animals evolve. I read it was around 10,000 years ago that we learned to cook grains and beans to make them edible. I must admit, my personal experience with a meat based diet is probably swaying my opinion. I tried the meat and vegetable based diet of Adkins several times and I felt horrible; I had less energy, felt like there was always a rock in my stomach and had lot of problems with digestion even though I was still eating lots of veggies along with the meats. I also have the additional issues that weigh on me as far as the welfare of the animals and the environmental costs of eating animals that have now been lifted since I have chosen this plant based diet. It’s so interesting to learn about the different theories though. I love it! As for the granola…..I think we are both on the same page with it. I think it could be enjoyed on any diet! I have one recipe for paleocrunch and I thought this entry was going to be filled with paleo granola recipes. Disappoionted as I like to make my own. I've been Paleo for a couple months now and feel great. 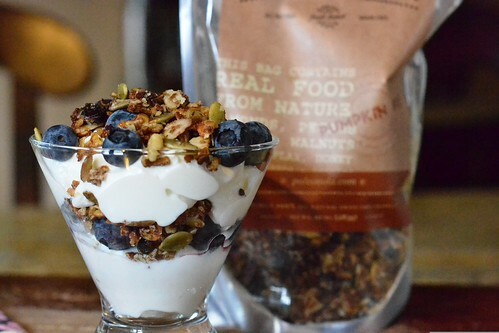 This granola sounds like the perfect Paleo snack too. I will have to check this out soon. Thanks! My friend started the Paleo diet a few months ago and I hadn't heard of it till then. Now I see blog posts and random articles about it quite frequently. I'm going to share this granola with him and grab a bag for myself! 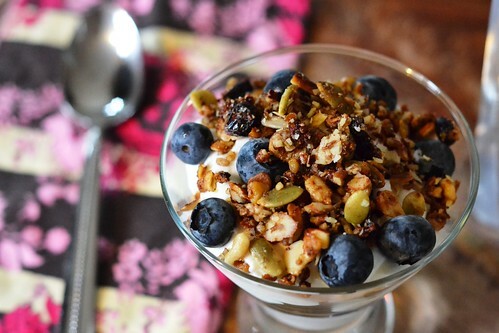 I love granola in my greek yogurt! Hi Cara, I am glad that you are an advocate of paleo. I also encourage my friends to take Paleo diet. Its health benefits are completely amazing! It’s unprocessed and reduces bloat. So, a flatter abs is within reach. Switching to Paloe diet was one of the best decisions that I have done. I managed to improve my overall health. Paleo diet is great. It helped me to lose my extra kilos and managed to keep them off. My blood pressure went down and cholesterol too. I have started my training again based on the Paleo diet. I believe that our ancestors knew better then us the positive results of each diet. That the way they survive in a planet which was much more inhospitable then today. You’re eating plan really inspires me, I am taking food supplements on my healthy diet too and I wish to try this one too.